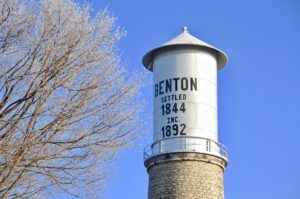 Benton and the surrounding area are filled with interesting things to see and do, and you have an open invitation to visit. The area is steeped in history and fascinating architecture. There are a number of museums both in and around Benton that offer a look into the past. Artisans have set up shop in some of the nearby towns, where there are many boutiques, gift shops, and antique stores to peruse. If you’re an outdoor enthusiast, this area is for you! The Mississippi River cuts through nearby Dubuque, Iowa, and Galena, Illinois, and offers boating, fishing, and various other water sports. There are a number of excellent golf courses in the surrounding area, from our local nine-hole course right up to 18-hole championship courses. Wildlife is abundant, and this part of the state is a paradise both for hunters and for those who simply enjoy seeing animals in their natural habitat. Snowmobiling, ice fishing, and skiing are among the winter sports enjoyed in the area. 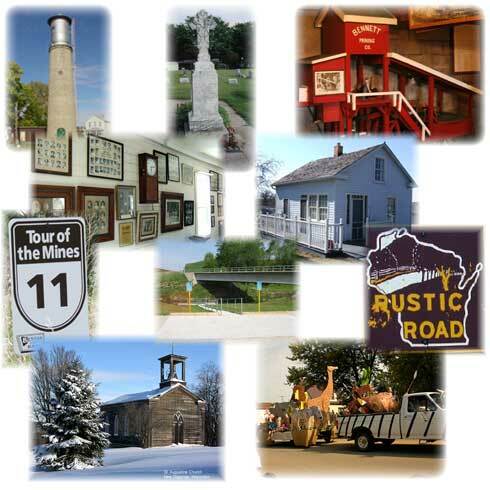 We invite you to experience the splendor of all four seasons here in beautiful Southwestern Wisconsin and to visit points of interest all though the region. Come as often as you like, stay as long as you want–you’re always welcome. You have an open invitation to visit Benton and the surrounding area. See what this region has to offer in terms of beauty; business opportunities; and a family-oriented, slower-paced way of life. Come by yourself, or bring your entire family. Experience a number of events and festivities that Benton organizations sponsor. Check our calendar of upcoming events–and don’t forget our Labor Day weekend celebration. Benton is the place to be on Labor Day weekend. The town virtually overflows with people, as families and friends return home for a weekend full of good times and Labor Day traditions. The weekend typically kicks off with Saturday’s Alumni and Friends Golf Tournament at Cole Acres. The town’s museums, filled with historical and educational memorabilia, are all open; the Fever River Puppeteers perform; and there’s a Saturday chicken barbeque for anyone having too much fun to cook. Labor Day wouldn’t be Labor Day without Benton’s parade, the best parade in the tri-state area. Following the parade there are midway rides, music, games, and a craft fair in the park; duck races at the Horseshoe Bend; and Benton’s famous pasty dinner–nothing says “Benton” like pasty! 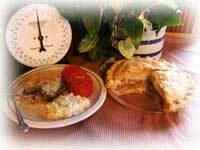 (For those of you who’ve never heard of the Cornish dish, pasty is savory layers of delicious meat and potatoes that have found a comfortable home inside a pie crust.) Labor Day’s activities close with the firemen’s raffle at 7 P.M. Residents of Southwest Wisconsin and visitors to the area are fortunate to have a large selection of restaurants and eating establishments that serve excellent food at affordable prices. The following is a list of dining places in and around Benton. Right Here in Town . . .
Now serving food on Mondays for lunch starting at 11 a.m. Hours: open at 3 p.m. Tuesday, Wednesday, & Fridays. Opens at 11 a.m. Monday, Saturday, & Sunday (closed Thursday). Serving up homemade pizza, specialty burgers, sandwiches, and more. Lunch specials Monday through Friday as well as “Game Day” food and drink specials for Badger and Packer games. Kitchen Hours: 11 a.m -9 p.m Tuesday thru Thursday, 11 a.m.- 10 p.m Friday & Saturday, 11 a.m.-9 p.m. Sunday. Free delivery within a 3 mile radius including Leadmine & New Diggings on Friday & Saturday evenings from 5 p.m-9 p.m. Bar Hours: 11 a.m. to close Tuesday thru Sunday (closed Monday). Serving down-home fun with the local bluegrass favorite, Fever River String Band, fiddling out the tunes on Thursday nights and the year long count down to St. Patty’s day, this is a true “Irish” bar. Hours: 4 p.m. to close Monday thru Saturday (closed Sunday). Check out the daily specials in addition to pizza, sandwiches, and hot bread sticks. Fresh breakfast pastries and cinnamon rolls available every morning. Hours: Monday thru Friday 5 a.m. to 10 p.m; Saturday and Sunday 6 a.m. to 10 p.m.
On the Outskirts of Benton . . . Try Anton’s famous Macho Burger or have a sandwich, something from the grill, or 2 for $1.00 tacos on Thursday night. (And leave room for Donna’s delicious homemade desserts or ice-cream treats.) Hours: Thursday thru Sunday 12 noon to close. Located west of Benton at the intersection of highways 11 and 80 and serving food from the grill or from the fryer. Summer hours: Wednesday to Sunday 4 to close (closed Monday and Tuesday during the summer). Winter hours: Tuesday to Sunday 4 to close (closed Monday during the winter). Hours: Monday 2 p.m. to 2 a.m; Tuesday thru Sunday 11 a.m. to 2 a.m.
You can’t really buy groceries here, but this bar will let you purchase a sandwich, grilled food, or a pizza. Open Thursday through Sunday, with live music Sunday afternoon from 3:30 to 7:30. Hours: Thursday and Friday 3 p.m. to close; Saturday 12 noon to 2:30 a.m; Sunday noon to close. Located on Hwy. 80 (toward Hazel Green) and serving a full dinner menu, including daily specials. Hours: 4:30 to 9:30 p.m. Thursday through Sunday. Located a few miles from town, through the small, rural settlement of Jenkynsville on Cty. H. The supper club serves a full dinner menu, complete with daily specials. Hours: Tuesday thru Saturday 4:30 to 10:00 p.m; Sunday 4 to 9 p.m. (bar opens at 4 each day). Closed Monday. Provides a safe, affordable ride for anyone who has been drinking or plans to drink. Call Road Crew to pick you up at home, take you to your place of fun, and return you safely to your home. You can even plan ahead and book Road Crew for your events such as weddings, parties, reunions, and more! Road crew services the following areas: Platteville, Lancaster, Dickeyville, Kieler, Belmont, Cuba City, Potosi/Tennyson, Arthur, Ellenboro, Benton, & Hazel Green. There are a number of excellent lodging accommodations within a short drive of Benton. Whether you’re looking for something sublime or something more modest–or something in between–you’ll find it right here in the area.